Sandusky waterfront. This line drawing of the Sandusky waterfront, ca. 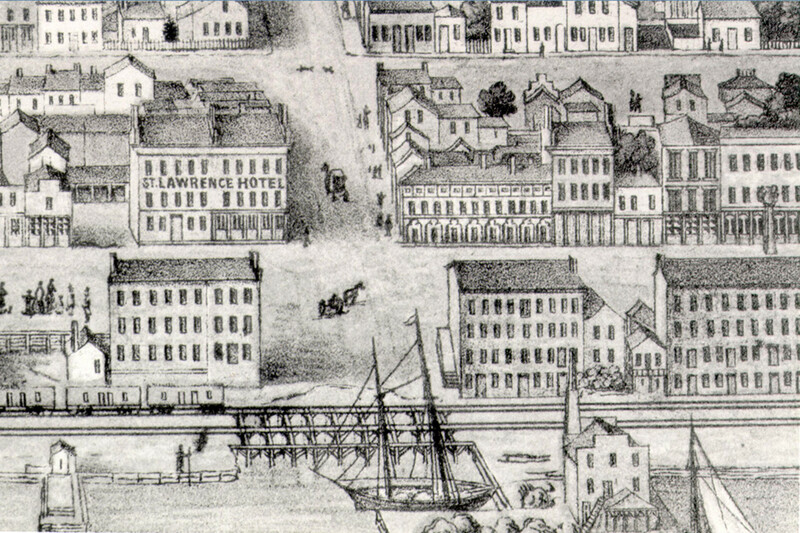 1850, shows the location of the St. Lawrence Hotel. Today when you look south from Fisher’s Hall at the Northwest West Corner of East Water and Wayne Streets you would be hard pressed to imagine that you were facing Sandusky’s most historic plot of land. In 1811 prior to the founding of the city, John Garrison was the first white man to build a home on what was to become the City of Sandusky. It was a log cabin 20 feet square with a 10 foot addition for a store and stood on the south side of East Water Street west of Civista Bank. Garrison was forced to abandon his, store, because of the impending War of 1812. Daniel Buel, a young trapper who boarded with Garrison, agreed to keep an eye on the store in Garrison’s absence, but was killed by Indians in the spring of 1812. In 1817, Zalmon Wildman, one of Sandusky’s first proprietors erected the “Old White Store,” the first frame building in Sandusky and a dock on the north side of what is now Water Street across from the Garrison cabin. 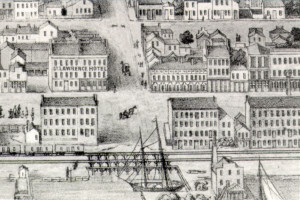 It is important to note that Water Street was once the northernmost street in the city. Shoreline Drive was constructed on fill that was added in the 19th century with the arrival of the first railroads.